We are pleased to unveil the recipients of the "Viking Awards" 2016, Xiaohan Shi and Ruiwen Xu. The choice of the two students was made by the college's selection committee based on academic achievement and community involvement. 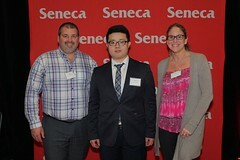 Steven Spearing (Reginal Manager - Viking Ontario) and Katherine Tipping (Inspections Coordinator - Vioking Toronto) had the opportunity to meet the two recipients of the "Viking Awards" at the Seneca College Award Ceremony. Congratulations to the 2 students! From left to right, Steve Spearing, Xiaohan Shi and Katherine Tipping.